Hi Friends! 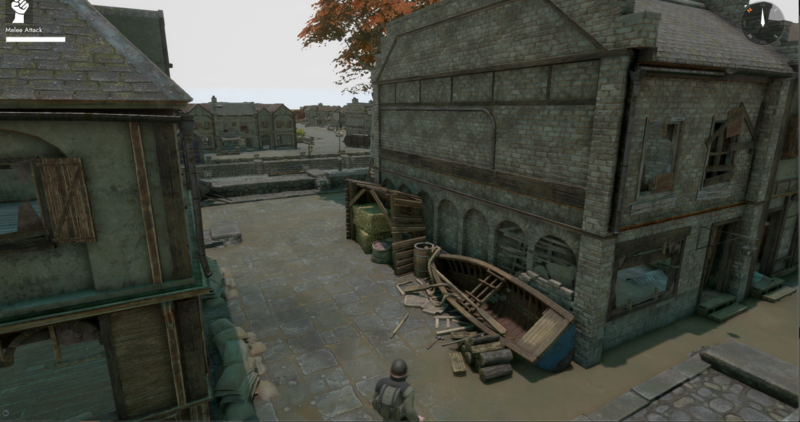 This is the final installment of our introspective on the town revamp. Graphics...the cornerstone of video games. Since the dawn of man we have strived to achieve good graphics, and now with this town revamp we are proud to use almost 100 graphics! Lets dive right into it and see the amazing work the team did. Disclaimer: All of the content below is heavily work in progress and is subject to change. @Matt So, the dreaded Town Revamp is done (ish, I could keep polishing until I'm dead) and we can finally talk in detail. By far the biggest challenge was scheduling. I knew that, due to other work that needed to get done: replacing all the rocks in the world, updating all the walls, etc., Max would be plenty busy. I was going to have to do a lot of the preliminary work without a safety net. We had a deadline. 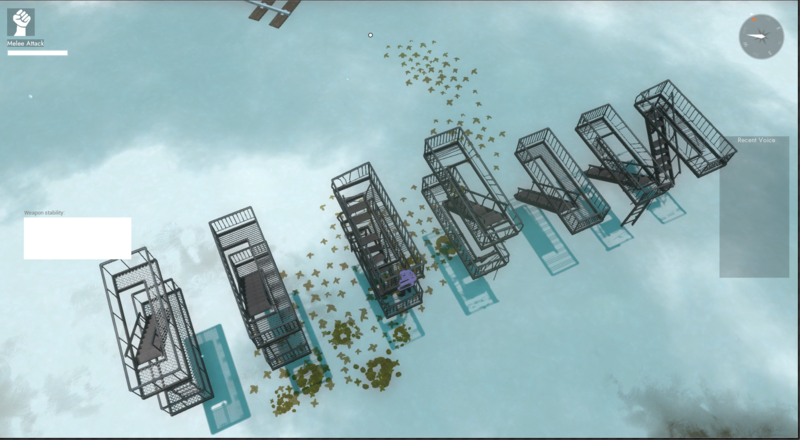 I deleted every town in the game and started from scratch utilizing some of the new tools available to me. Although, early on I was looking at block-in models, as the guys on the art team were still plucking away on the final assets. This lead to some funny things down the road, where houses were backwards, or props didn't turn out at all how I'd imagined when they were just white. 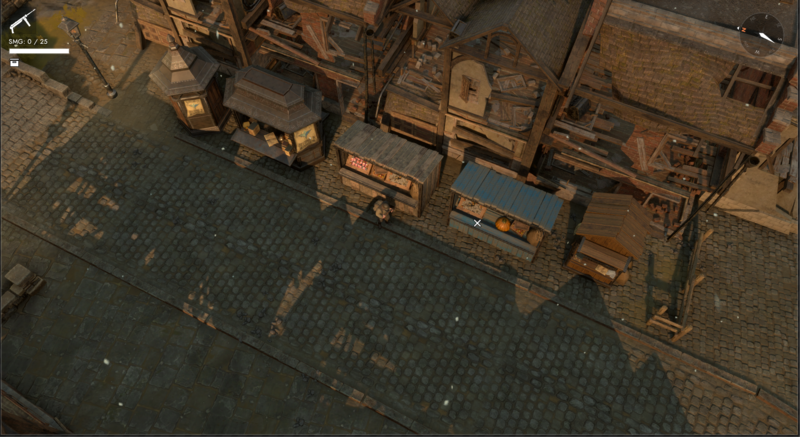 Once we reviewed everything, I assigned Max and myself a series of maps, and we pushed off and started polishing the over 100+ towns in the game, with not a lot of time to do it. By the end, we even brought on Leon as he wrapped up his work. In order to get the work done on time, it was vital we stuck to the schedule. 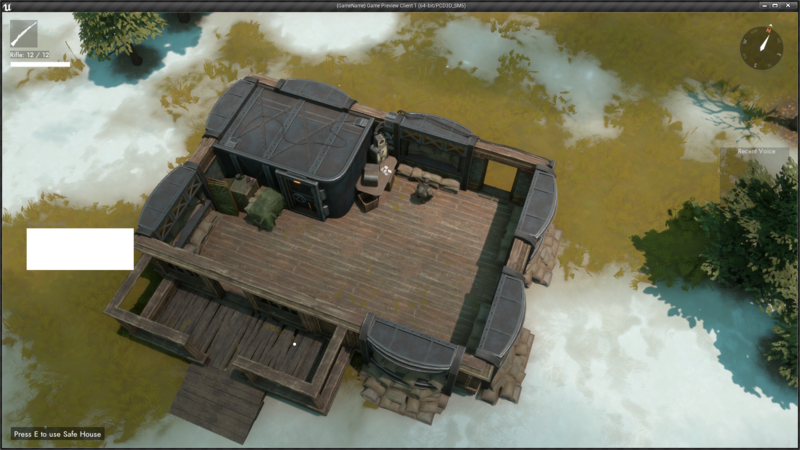 Replacing everything in Foxhole, the ever looming deadline devil will be your downfall. Looking back now, I think the world is a lot closer to the way I'd originally imagined it when we started the project two years ago. It's past the stage of prototype art and on to something we really planned. There's room for improvement, but that's the exciting part. Given that Foxhole is still in early access, this isn't the end. It's just the foundation for us to build on. 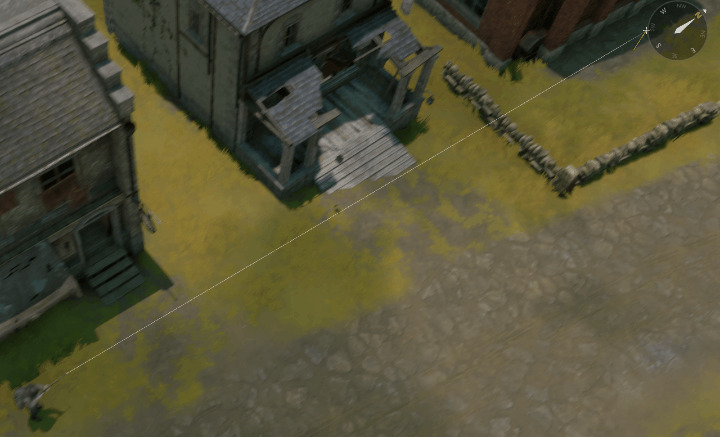 In one of our first planning sessions of the revamp Matt brought up how he’d like to give the ground textures an update and how important they are to Foxhole considering that its a top down game. This fell very much in line with revamping the town's themselves. It was around this time that we seriously started incorporating Substance Designer into our pipeline. Originally the maps were made primarily with only a handful of actual landscape textures and we knew that if we were going to get a more polished look to the world we were gonna need more than what we started with, and we're gonna need to be able to iterate and test visuals quickly. Designer was the obvious choice. One of the first textures we upgraded was the grass texture. Underneath those blades of grass is a simple grass texture that incorporates those brush stroke patterns I talked about in the last devblog. The grass was far more difficult to nail the look of then we expected (a tricky nugget, if you will). 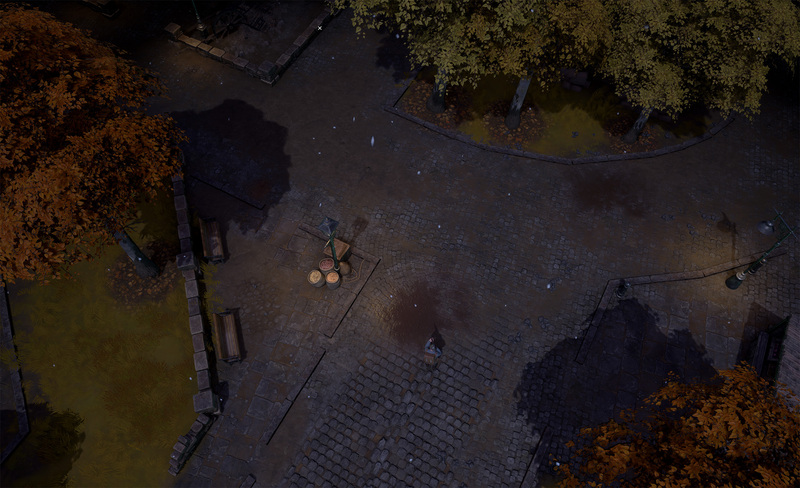 Foxhole has a very particular lighting system, set up very specifically to capture the style of foxhole, that being said it is very sensitive to subtle changes in a texture. We tried a few versions of the grass before we landed on the look you actually see in game now. With this foundation we moved forward and applied the logic and art philosophy to all the coming landscape textures in game. We knew we needed more variety from our ground textures if wanted to make the world as a living breathing place. 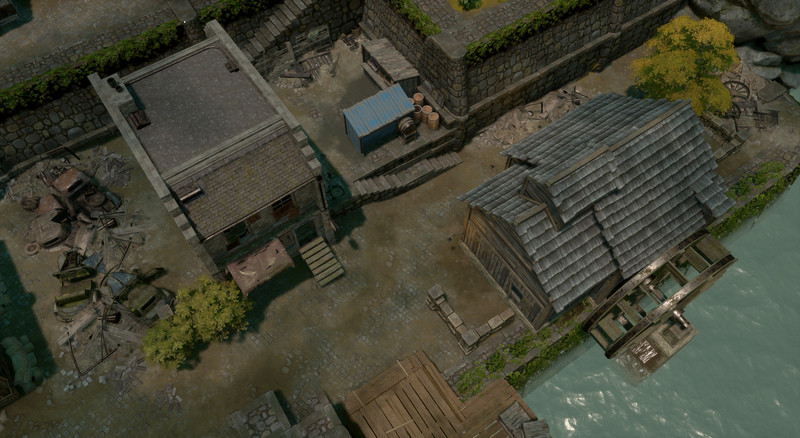 Once we knew the scale restrictions, and had concepts and a general town design direction, it was time to make them! 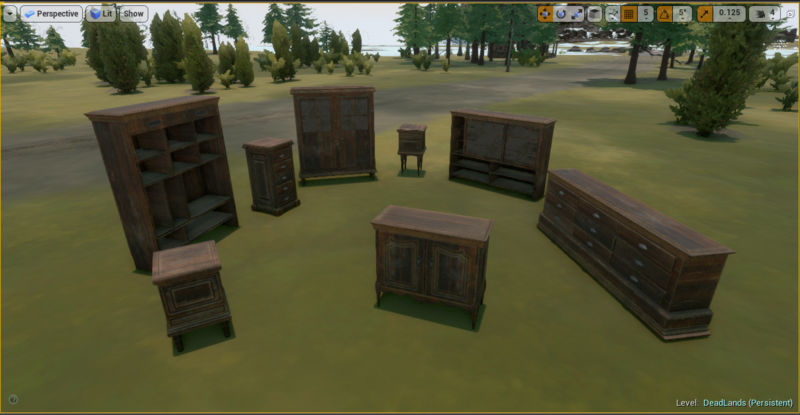 There are many ways to go about making assets like these, in many open world games there is often a level of procedural generation when creating large amounts of structures, but at Clapfoot we definitely love the somewhat “old school” way of having a hands on approach to art. So once I was given the design specs from Matt and the concepts from Julian I built myself a general kit to use when creating these assets. Every piece had very careful consideration to make sure scale was appropriate, and that we can iterate and create variations as painlessly as possible. This is where the scale/texel density becomes super important because if we wanted to swap out textures to create variations we can. If the textures were all set to different scales or the UV’s of the 3d model itself weren’t created to match the texel density standard of 300cm x 300cm we would have to go and manually adjust each texture or mesh which can time consuming. The revamp has been fun, stressful and exciting, we’re super excited for you guys to get your tanks on it. Anyway that's all from me for this blog! Can’t wait for you guys to see what we’ve been cooking up! 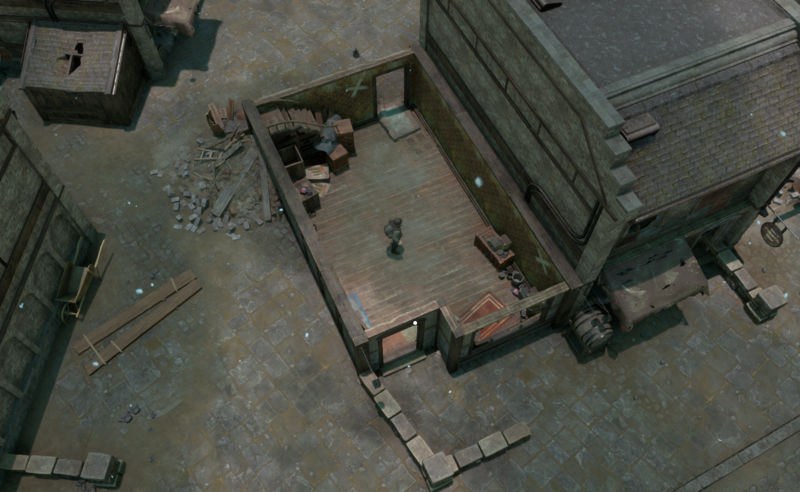 Also here is a gif of me hand laying shingles... for the love of Foxhole! @Mark As we started closing in on the weeks leading up to release, we started to have to worry more and more about practical matters like technical constraints and game design corner cases. Up until this point, I had been part of the planning and evaluation of the town revamp, but I hadn’t gotten my hands that dirty yet. Before 0.19 was even out the door, I already began sprinting towards 0.20 because I was aware of the scope of work ahead. There were several major tasks that had to be done. First, we had to do a big review of the work that was done so far which turned out to be a multi day process. 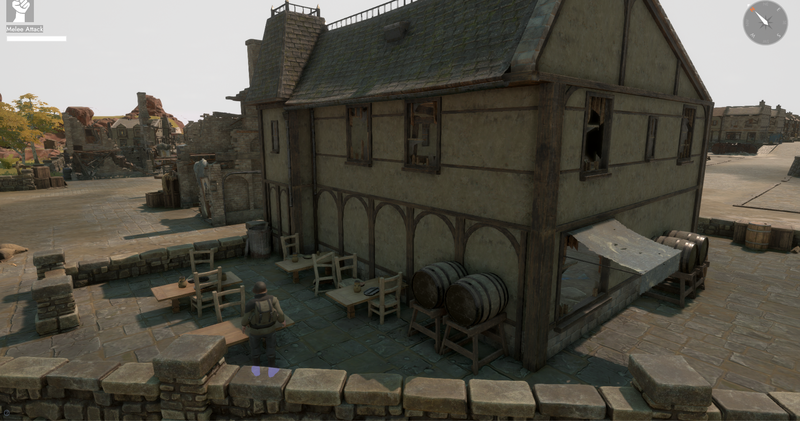 We sat down and literally walked around almost all 100+ towns, making sure that the layouts and design met our gameplay goals. It was a draining exercise, but given that we had advocates on the for both gameplay and immersion, the result was a well balanced evaluation of the world. 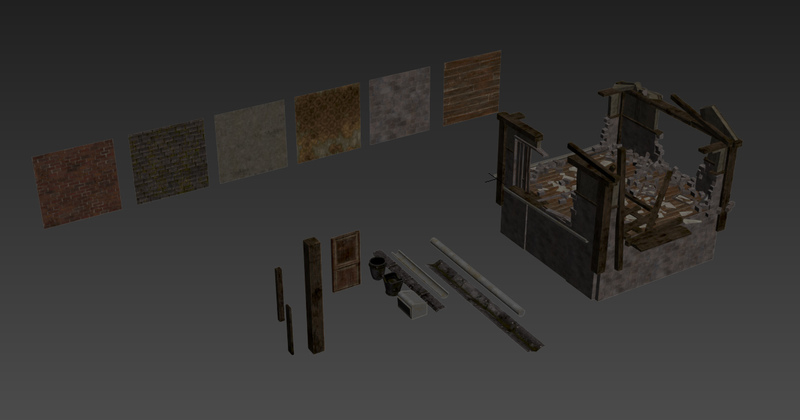 The next major task we had to do was to do a technical review of all the new Garrisoned Houses (and other buildings) we were adding to the game. During this review, we realized a weakness in our current system: the process for integrating new Garrison Houses into the game required far too much manual work and was also error prone. What worked for a few Garrisoned House variations did not for dozens. 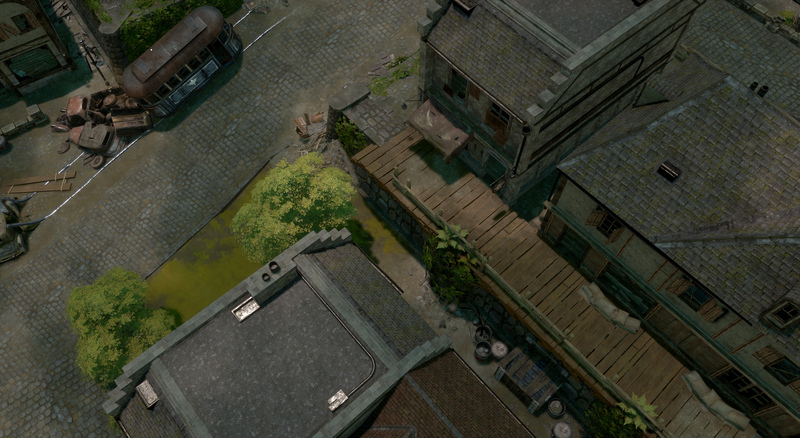 To work around this we had to implement new reusable components in code that allowed us to quickly add features like disappearing roofs and AI firing from windows to any new building asset. 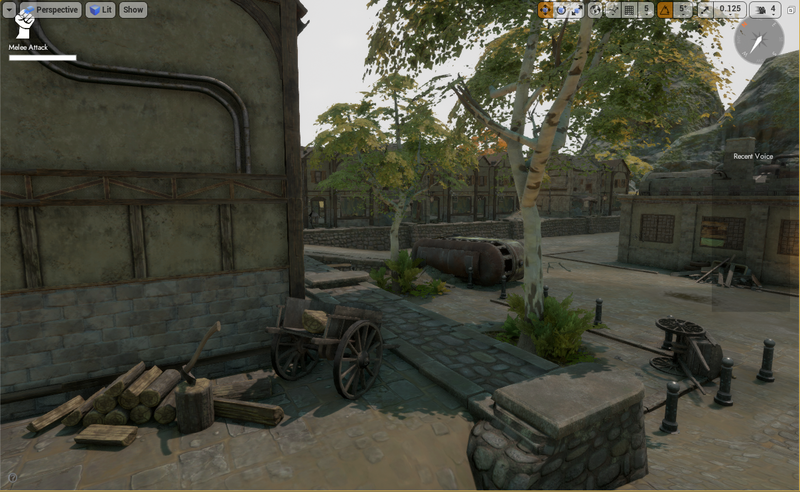 There were numerous other technical and gameplay challenges we had to address, such as supporting densely packed town environments without encumbering the server and dealing with possible ways that players might exploit our new environment layouts. 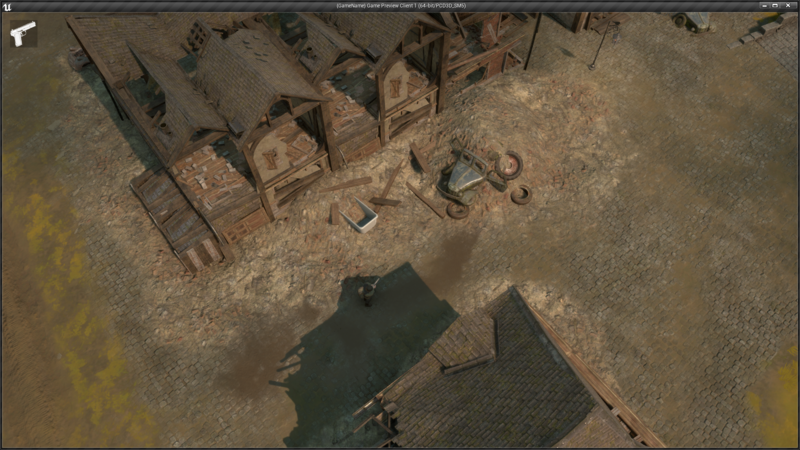 Along the way we also added several really cool features that I believe will help support the town revamp. 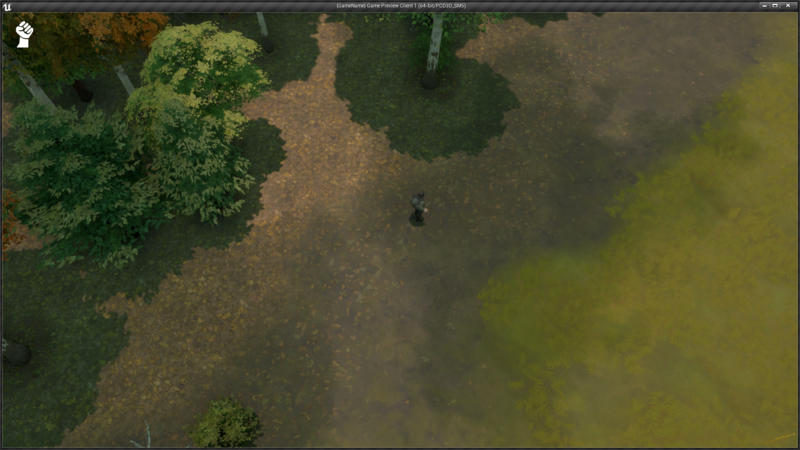 First, we implemented a brand new camera system that is far more dynamic than before. 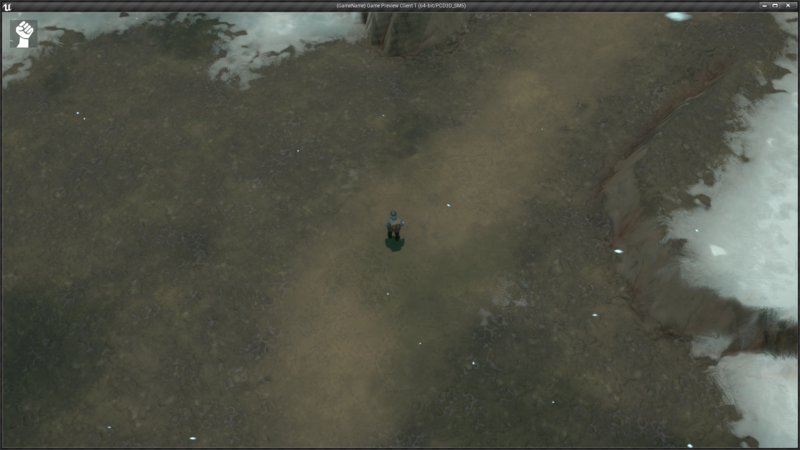 It has a higher FOV, which results in less “warped” looking environments from the top down perspective. 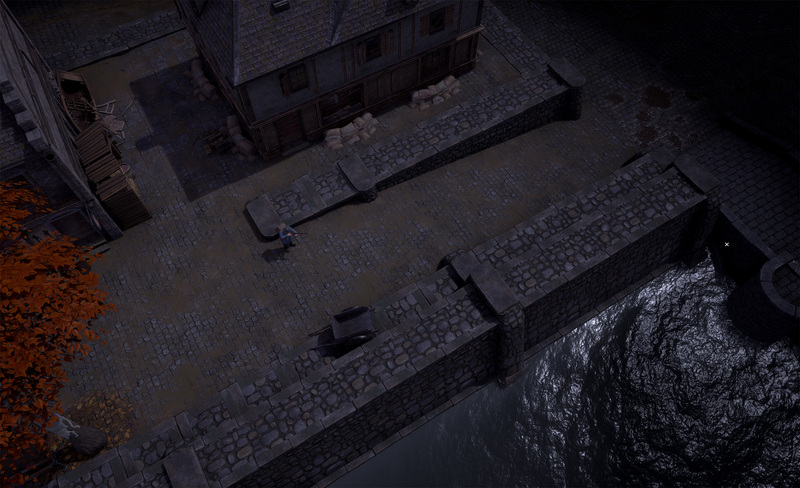 The camera zooms out when the player is aiming further way, providing a more strategic view of the battlefield. 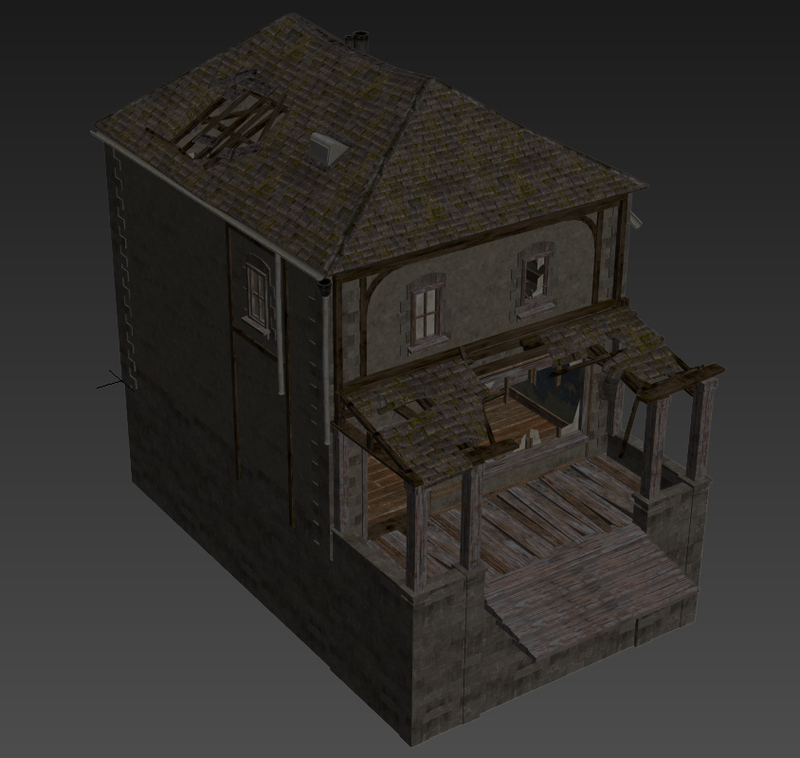 Second, the further increase the defensibility of towns, we added the ability for players to mount the Garrison House windows. 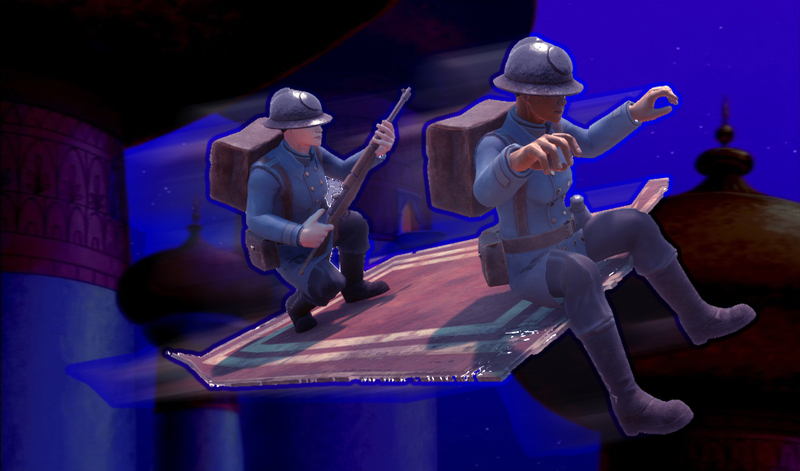 The mechanic works similar to mounting Foxholes, except the players must be inside the house first. Besides these, there will be a few more surprise features that will be revealing in the coming days. Stay tuned for more.